Jason Beem, a veteran race caller with more than a decade of experience, will handle Monmouth Park’s announcing duties until the return of Frank Mirahmadi following the conclusion of the Santa Anita meet on June 23, general manager Bill Anderson announced Monday. Beem, a Washington state native who called races at Portland Meadows for 10 years starting in 2006, will begin his new assignment when Monmouth Park kicks off its 74th season of Thoroughbred racing on Saturday, May 4 – Kentucky Derby Day. Mirahmadi will return for his fifth season at the Jersey Shore track starting with the June 28 card. He was hired as the full-time announcer by Santa Anita last fall. Beem, who has also called races at River Downs (now Belterra Park), Louisiana Downs, Emerald Downs and during the Gulfstream Park West meet, has never actually been to Monmouth Park, he said. But he knows exactly what the legacy is of the announcer’s booth that he will be stepping into. “They’ve only had a handful of guys there that have called races recently, and if you look at Monmouth Park’s last three announcers – Larry Collmus, Travis Stone and Frank Mirahmadi -- you’re talking about the guy who calls the Breeders’ Cup, the guy who calls the Kentucky Derby and the guy who calls Santa Anita,” said Beem. “So I’m flattered even as a fill-in to get the opportunity to call there. Beem, who also has done a daily podcast for BetAmerica since 2015, says he is well aware of the history of Monmouth, having learned about it from afar. Monmouth Park will offer $7.1 million in stakes races this summer during a 61-day meet that runs through Oct. 27. Racing shifts to the Meadowlands in East Rutherford for Fridays and Saturdays in October, with Monmouth Park hosting Sunday racing that month. 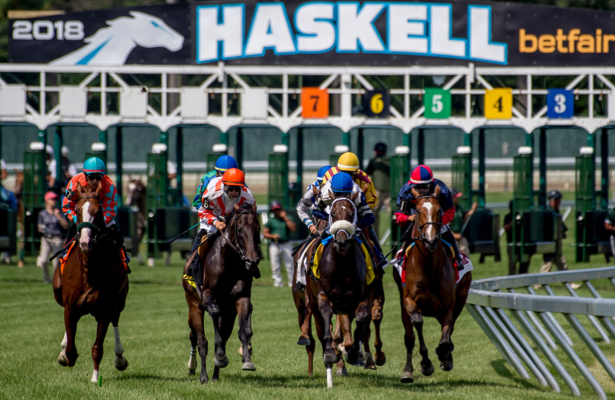 The Grade 1 betfair.com Haskell Invitational on Saturday, July 20, will highlight Monmouth Park’s stakes schedule. Overall, there will be 64 stakes races, 12 of them graded, during the meet. The 52nd Haskell Invitational carries a purse of $1 million. In addition to the six stakes races on Haskell day, the track will again feature additional “bundled stakes days,” with four stakes races on the May 25, June 22, Sept. 1 and Sept. 28 cards. There will also be a strong Jersey-bred flavor to the meet, with 11 New Jersey-bred stakes races. The 17th annual New Jersey Thoroughbred Festival on Aug. 25 will feature three stakes races among the 11 New Jersey-bred races that day. All stakes races this year will carry a minimum purse of $75,000. The meet kicks off with the 41st running of the $100,000 Cliff Hanger Stakes at a mile on the turf for 3-year-olds and up on opening day.